4 June 2014 – Madison, WI and Vancouver, CANADA – Freshwater resources in Dane County are getting relief from the pollution caused by excess phosphorus thanks to innovative nutrient recovery technology installed by the Madison Metropolitan Sewerage District as part of its “11th Addition” Project. Today, the District’s Nine Springs Wastewater Treatment Plant (WWTP) marked the launch of the 11th Addition with an open house that saw the official opening of its nutrient recovery facility, which it installed in partnership with Ostara Nutrient Recovery Technologies. Part of the District’s continuous improvement program, the facility will help protect area freshwater lakes and rivers by recovering phosphorus from wastewater streams at the plant and transforming it into an environmentally responsible fertilizer, Crystal Green®. The fertilizer will soon be available to gardeners and homeowners in all-purpose garden blend created by Jackson-based fertilizer blender Spring Valley and sold through local retailers. On hand to address officials and guests at the event were Dane County Executive, Joe Parisi, and attorney and environmental advocate, Robert F. Kennedy, Jr. The state’s freshwater systems are the primary driver of the $12 billion tourism industry, $2.3 billion of which is directly attributed to sports fishing. According to the Association of Wisconsin Lakes, phosphorus runoff is the number one threat to the state’s freshwater resources, negatively affecting an estimated 90% of inland lakes. Excess phosphorus contributes to the growth of algae, which chokes off sunlight and oxygen, destroying aquatic life and impairing fish populations. The latest installment of the Nine Springs WWTP’s continuous improvement program, the 11th Addition enhances the plant’s digestion process and maximizes the recoverability of nutrient resources for beneficial reuse. As a result, Nine Springs is positioned to produce a compost-like product that is capable of being handled safely and used as land-applied fertilizer. The plant also recovers phosphorus and nitrogen from waste streams and converts the nutrients into an eco-friendly fertilizer using Ostara’s technology. Started in 2008, the 11th Addition Project was completed on time near the end of 2013. By removing potentially polluting nutrients from the treatment facility’s wastewater stream, Ostara’s technology helps the District meet nutrient discharge limits and overcome operational issues caused by the unintentional build-up of struvite scale in plant equipment. Struvite is a concrete-like mineral deposit that chokes process equipment, increases operating and maintenance costs, and undermines plant reliability. The Ostara system, known as the Pearl® process, will help overcome these challenges by recovering up to 85 per cent of the phosphorus and 25 per cent of the nitrogen from the wastewater stream before they accumulate in the equipment. The recovered nutrients are transformed into a slow-release, eco-friendly fertilizer called Crystal Green. The nutrient recovery system installed at Nine Springs WWTP will result in annual cost savings and provide a revenue stream to the utility for each ton of fertilizer produced. The system cost $3.0 million. A blend of slow-release phosphorus, nitrogen and magnesium (5-28-0 +10% Mg), Crystal Green is the first nutrient technology to be sustainably made from renewable sources. Unlike conventional water-soluble fertilizers, Crystal Green is highly insoluble in water. Instead, it is Plant-ActivatedTM releasing nutrients in response to root growth, resulting in greater efficiency, lower application rates, and reduced risk of nutrient loss through leaching and runoff. The two Pearl 2000 systems installed by the District have a combined annual production capacity of 1,300 tons of Crystal Green. Because of the way it is formulated, Crystal Green falls outside the stringent phosphorus turf fertilizer ban in Wisconsin, allowing the state’s users to apply Crystal Green where conventional phosphorus fertilizers may be otherwise restricted or banned. Wisconsin fertilizer company, Spring Valley has already committed to include the environmentally responsible fertilizer in a new garden blend product to be sold throughout wholesale and retail outlets. In the agriculture sector, Wisconsin farms are among a number of sites throughout the north and Pacific Northwest where Crystal Green has been successfully used in grower trials on various crops including potatoes and fruit trees. Madison Metropolitan Sewerage District formed in 1930 to protect our public health and environment. Governed by a five-member Commission, MMSD serves approximately 180 square miles and a population of 340,000 people in the greater Madison area. Our service area includes five cities, seven villages and 28 sanitary/utility districts and stretches from Dane and Morrisonville in the north to Verona and Lake Kegonsa in the south. For over 80 years, the District has operated a complex system of pipes and equipment that convey, treat and return wastewater to the environment. To convey the wastewater generated from homes, businesses and industries throughout the service area, MMSD operates and maintains approximately 96 miles of gravity sewers known as interceptors. These interceptors collect and transport wastewater from smaller sewers, to regional pumping stations operated by the District. All wastewater flow generated in the region, approximately 40 million gallons per day, is pumped to the Nine Springs Wastewater Treatment Plant. Once at the plant, the wastewater proceeds through an advanced treatment process that recovers valuable resources, including treated effluent, energy, biosolids, and phosphorus used in the production of Crystal Green®. The 11th Addition Project follows in the footsteps of the previous ten major Plant additions, which have occurred over the last 80 years. The primary focus of the 11th Addition is to assure a reliable and sustainable digestion process capable of producing Class A biosolids. The Addition features an Ostara system that recovers phosphorus via the production of small fertilizer granules known as Crystal Green®. Planning for the 11th Addition started in 2008 and the detailed design was completed in 2011. Since that time, the project has been under construction with work nearing completion at the end of 2013. Total construction cost of the 11th Addition is expected to be near the contract cost of $40 million, which is one of the largest monetary projects ever undertaken by the District. Vancouver-based Ostara helps protect precious water resources by changing the way cities around the world manage nutrients in wastewater streams. 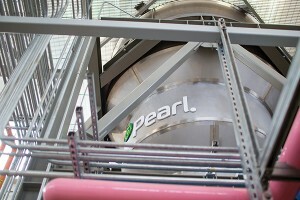 The company’s Pearl® technology recovers phosphorus and nitrogen at municipal and industrial wastewater treatment plants and transforms them into a high-value, eco-friendly fertilizer, Crystal Green®. The process greatly reduces nutrient management costs and helps plants meet increasingly stringent discharge limits while improving operating reliability. Crystal Green is marketed through a global network of blenders and distributors to growers in the turf, horticultural and agriculture sectors. Its unique plant-activated mode of action improves crop yields, enhances turf performance and significantly reduces the risk of leaching and runoff, thus protecting local waterways from the nutrient pollution. Ostara operates multiple facilities throughout North America and Europe and recently partnered with the City of Chicago to build what will be the largest municipal nutrient recovery facility in the world when launched in 2015. The company is the recipient of numerous awards including a World Economic Forum 2011 Technology Pioneer, the Global Cleantech 100 and Deloitte’s Technology Green 15. For more information please visit www.ostara.com andwww.crystalgreen.com.